Two contractors who lost the bid to fix the synthetic turf at the University of Hawaii's Cooke Field have filed formal complaints about the university's bid award, stopping all repair work. "Under state law, all work has been suspended until the resolution of the (protests)," said UH spokesman Gregg Takayama. The school's procurement office is working with school attorneys to respond to the protests, he said. The project's second-lowest bidder -- Applied Surfacing Technology -- and the fourth and highest bidder -- Service Contracting -- both filed their letters of protest after the Aug. 13 deadline for protests. Applied Surfacing Technology, which bid about $20,000 more than the winning bidder, RMY Construction, claims that RMY's listed subcontractor does not have a license to do the work. According to the protest, the subcontractor's manager has a license, which is not transferable to the company. Service Contracting, which bid $380,000 more than the winning bidder, claimed in its protest letter that RMY's subcontractor, Sports Turf Hawaii, does not have the proper license to do the work. According to the state Contractors License Board, a specialty license is required to install synthetic turf at sports stadiums. At a board meeting yesterday, the board upheld its decision requiring synthetic turf contractors to have a special license. The board's decision is a nonbinding guideline and not law. The University of Hawaii Board of Regents has re-elected Allan Landon to a one-year term as chairman of the board. The university said yesterday that Howard Karr was elected vice chairman. Landon is chairman and chief executive officer of Bank of Hawaii. He joined the Board of Regents in 2005. Karr is a retired bank executive who joined the board earlier this year. Need a car wash? You can have it done by some of Hawaii's top executives and contribute to programs to help people with brain injuries. The Executive Car Wash will be from 9 a.m. to 2 p.m. today at the Rehabilitation Hospital of the Pacific parking lot, 226 N. Kuakini St. The cost: $10 for cars, $15 for vans, sports utility vehicles and trucks. The MW Group, LTD's BRIDGE (Breaking down barriers, Respect for others, Investing our resources, Giving of ourselves, Everyone makes a difference) program is sponsoring the project. The organization encourages employee volunteerism by "donating" $20 an hour to an employee for up to 12 hours a year to participate in community projects. Employees donate half of their "earnings" to a charity of their choice. The other half goes into an MW Group community fund. A committee of employees reviews requests for money from the fund at the end of the fiscal year and decides which groups or projects will be supported. Funds from the Executive Car Wash will be used for REHAB Hospital's programs to help people with brain injuries or illnesses become as independent as possible. Police are asking for the public's help in finding a 67-year-old McCully man who is deaf and has diabetes and arthritis. Police said Jerry Cooper was last seen 6:30 p.m. Thursday at his Wiliwili Street apartment. Cooper is described as Caucasian, 5 feet 10 inches tall, weighing 250 pounds. He is bald and has brown eyes. 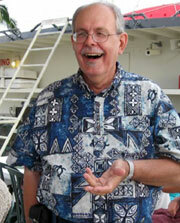 He was last seen wearing a blue aloha shirt, khaki shorts, black socks and rubber clogs. Anyone with information is asked to call CrimeStoppers at 955-8300 or *CRIME on a cell phone. KAPAA » The smoldering brush fire in Kauai's remote Hanakapiai Valley is still burning after a week, keeping the Kalalau Trail closed, state officials said yesterday. The fire is not moving, but still is smoldering in spots, said Deborah Ward, spokeswoman for the Department of Land and Natural Resources. The area is steep and difficult to reach on foot, she added, and county-contracted Inter-Island Helicopters was unavailable again yesterday. State firefighting personnel will continue monitoring the fire over the weekend and will call for helicopter support if it flares up again. The Kalalau Trail will remain closed until the fire is declared controlled and safe for public use, Ward added. A pathologist deferred yesterday the determination of the cause of death for Roberta June Whitehouse, 51, whose body was found Wednesday in a Hilo apartment. The pathologist is awaiting results of toxicological tests. Whitehouse's housemate, a 48-year-old woman, was arrested for suspicion of second-degree murder but was released pending an investigation, police said.